Dating to the 1960s is this pretty sequined evening bag. 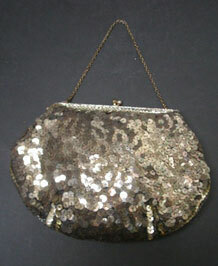 It is covered with silver coloured sequins with a silvertone clasp and short chain handle. it is lined in cream and label reads MADE IN FRANCE. SIZE: 14x19cm / 5.5 x7.5 inches.